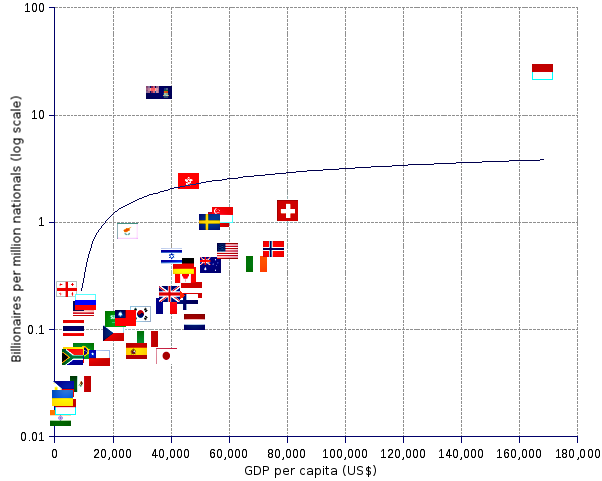 The scatter chart shows the the world top 500 billionaire headcount index (number of billionaires per million inhabitants: y-axis, logarithmic scale) as a function of their home country's GDP (Gross Domestic Product) per capita (x-axis). The trend is indicated by the blue dotted curve. The r and the R² statistics indicate that the billionaires per million index has only a flimsy correlation to the country's GDP per capita. Above the (logarithmic) trend curve, appear those countries whose prosperity is boosted by luring the super-rich foreigners who earn their income elsewhere. Monaco provides a shining example, it is a sanctuary for the rich and famous of the sports, the performing arts, the finance world. The Cayman Islands and Hong Kong are also in the lot. How should we call them? Profiteers, freeloaders? Sanctimonious national administrations and international organizations consider it legitimate, nay an imperative to chase and crack down on the regular salary-earning taxpayer who tries to protect his disposable income from the revenue services' sharp claws. Any attempt to evade taxation is a crime and a moral felony justifying harsh punishment and social reprobation. But that is for the common citizen, it is a one-way street. The state itself is exempt. The state can offer tax shelters, lump sum taxation schemes and tax exemptions to foreign taxpayers, preferably the rich ones, although middle-class pensioners will also do. While enforcing patriotism in the school curricula, the state can sell citizenship and the accompanying passport to foreigners wealthy enough to pay. The state can issue residence permits, aptly called gold visas , to rich foreigners keen to circumvent residence regulations or to launder dirty money. No big deal — it is just good, sound, creative, pragmatic statesmanship. Not comparable to greedy, mean, despicable maneuvering by the nameless taxpayer to try and save a couple of dimes. Towards the center of the chart and close to the curve, one finds the group of prosperous economies such as Switzerland, the Scandinavian, Germany, the Netherlands, United States, Australia, etc. with a high GDP per capita, typically above twice the median, and a sizable number of billionaires. It makes sense. The lower left area is crowded with low GDP per capita countries, of which some concede a large percentage of people living below the US$1.9 per day poverty line. India, Indonesia, Philippines and South Africa confess two-digit percents of people struggling in dire poverty while at the same time feeding billionaire fortunes. China may be the very paradigm of the billionaire extravagance. Still ruled under a so-called communist regime, whose avowed goals are to build an egalitarian, class-less society, of which profit-makers and exploiters will be excluded, a genuine paradise on earth for the workers, China embodies the antinomy of a GDP per capita that is about one fourth of the median or the average, and the second largest set of billionaires, in number as well as in aggregate net assets, just after the United States. ¹ GDP in current US dollars, most recent World Bank estimates for 2017. Data for Cayman Islands, Monaco, and Taiwan, unavailable in World Bank, is extracted from CIA World Factbook. ² Poverty headcount ratio at $1.90 a day (2011 PPP) (% of population), and Poverty gap at $1.90 a day (2011 PPP) (%) are available from World Bank. ³ n/a = not available. ⁴ Coefficient of correlation (Number of billionaires per million nationals , GDP per capita). ⁵ Coefficient of determination (Number of billionaires per million nationals , GDP per capita). Sources: The Bloomberg Billionaires Index, 2019, United Nations Population Division, The World Bank-DataBank, CIA - The World Factbook.